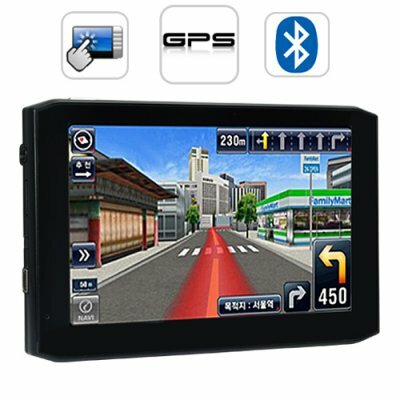 Successfully Added OfficeNAV - 5.0 Inch Touchscreen Portable GPS Navigator to your Shopping Cart. If you're living the mobile office lifestyle, you owe it to yourself to get The OfficeNAV GPS Navigator. It's portable yet mounts in-car. It's a first class GPS device. It's got Bluetooth with a FM Transmitter. Get things done with The OfficeNAV! Portable Yet Dependable - If you're on the road a lot, then meet your new best friend. Unlike your wife, this GPS unit won't nag you or ask you to mow the lawn. What it will do is meet your every driving need. Perfect as a handheld unit, just as good as an in-car navigation device, The OfficeNAV brings the office into the car that has become your home. Class A GPS Device - Trust The OfficeNAV, it uses the Windows CE 6.0 operating system. With this OS, you have access to the most cutting edge GPS maps and software titles. The benefit to you is, whether you're buying or downloading maps from the web, you'll be have incredible features like: lane assist, voice guidance, 3-D views, and more. Bluetooth, FM Transmitter - If you're looking for a mobile office, The OfficeNAV should be on the top of your shopping list! It features Bluetooth functionality with an FM transmitter. Basically pair your cellphone to CVMF-CS33. Then use the FM transmitter to transmit the calls to your car stereo system and out your car speakers. Talk to your callers with both hands on the steering wheel. "Where are the TPS reports Smithers?" The OfficeNAV, a reliable GPS Device at an affordable factory direct China Wholesale Price and our famous one year quality warranty. Order yours today and we will ship it out tomorrow! You don't have to pay to use GPS. The satellites which transmit GPS coordinates are maintained by the US government. You just need a GPS receiver to take advantage of the data. The OfficeNAV - 5.0 Inch Touchscreen Portable GPS Navigator contains a top of the line GPS receiver. The device is a excellent piece of hardware . The screen is really big and very clear. To be honest I was not expecting something so good. For sure I'm going to be a constant customer. El gps llegó en 10 días a España. El programa del GPS viene muy completito y que venga con el IGO 8 preinstalado con todos los mapas es muy bueno. Se puede instalar el MioPocket u otro software con relativa facilidad. Bello, veloce e preciso, arrivato in 4 giorni a Roma.